Good day to all of you! 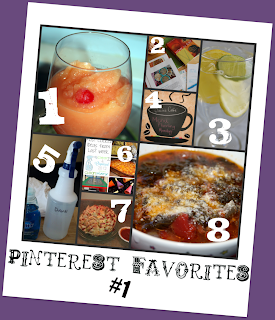 Here is my first ever Pinterest round up. Each Saturday I'm going to list some of favorites that I found (in no particular order.) I'll list mine here for you to check out and pin if you want. I'm including a linky so you can feel free to link up any of your Pinterest blog post or some of your favorite links, including your own! This is a brand new weekly link up. I"m always looking for cohost! Let me know if interested. For this to work, click some to pin and my post! Follow me on Pinterest and I'll follow you back. If you aren't on Pinterest and want an invite, leave your email address or go look at my top contact page and email me your address and I will send you an invite. Very simple! Happy Pinterest Saturday! 5- Make your own window cleaner! What a great idea. I'll share this one today! Thanks for including my post (#5). I have a question for you: how did you make the collage graphic? Thanks. This is a cute idea! Thanks for including my rainbow citrus water.